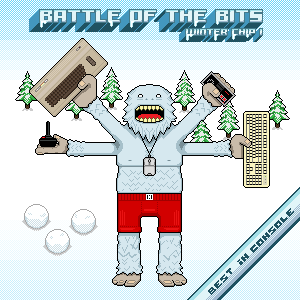 Well it took me a little longer than I had thought but BotB is now ready to handle competitions of multiple file types. I am eagerly curious to find out how all this goes down. If anyone has any problems with the site please <a href="mailto:puke7@firteen.com?subject=BotB troubles..">let me know</a>. ill be c64'n it, thanks for the great opportunity mr. langelio. THIS SHALT BE INTERESTING;; YARRR!!! okey im creating my first nsf for this compo,and dont know much about nsf,more used to mods..hehe...and im using famitracker...anyways whats this all about "2A03 VRC6 VRC7 MMC5 FDS N106 FME7"? If you are using FamiTracker then your track is 2a03. There were different extra chips in alot of cartridges. Konami had their own (vrc) and Capcom had one too (mmc5). I think you can only program those using an extra .dll with MCK/MLL. you can do N106 and FDS without any extras with MML... but MMC5 takes a little extra, and both VRC6 and 7 take a lot of extra files. really, extra channels does NOT make a better chiptune in my opinion-- it's how you use what you've got. Hi, i think the compo is not much different enough, coz of the technical equipment ie. 4 chan amiga mods and/or 32chan PC mods, much people will vote for mods with much chan. i think! Anyway...Amiga 4ch. chipz rules !!! tiny tunes from which we all came from"
what software do you use to make 4 channel amiga mods? are you saying PC/DOS mods should be more restricted? I use Exolons startrekker 1.3 on my amiga. Yes i know the existing of more then 4 chan progs on the amiga like octamed, ftm etc. and of course startrekker, but most mods quality will be very bad on more then 4 chans. Then it is much harder to make a 4 chan tune that sounds good, instead a 32 chan PC mod. I dont want more different chip types, better is to straiten the channels to ie. 4. I think that is very hard to choose the best chip mods when there are so many different conditions like 3,4,5 and 32 or 64 channel mods. Perhaps the next chip compo is in more different "categories" like 3,4,5,32 and 64 channel tunes ? which leaves the S3M/XM/IT to another category.. Yes, the conditions are all very different but that is kind of the fun. That is why file sizes are limited. Chip music comes from many different places on many different platforms. I am making this all up as I go. I still have much to learn and want everyone who participates to have a positive experience. I think many people on this site won't even know how some chip musics are different -- which leaves the voting up to your musicianship. With 11 days left, all entries are from Europe cept one. Americans never wait until the last minute. by the way thr tracks so far have been quite enjoyable, cheers! good question. maybe if you eat tootsie pops an owl won't give you the answer. Can I still submit something to this? You're not an owl b00daw, and i ain't eating tootsie poopies either.. I cannot understand the haeit! I wonder how many latist points one would get if they late-submitted to this compo…..
Goddamit I never thought he'd be 12 by now, I'm still thinking he's 8. FamiTracker didn't have support for expansion chips back then, and IT2NSF wasn't even a thing yet. StinkerB06 was probably still in the womb when this was happening. And Xemogasa was like 3 years old. What the heck. This compo makes us look like babbys!! This was my second compo on BotB. And I was 27 at the time. Oh, this compo! Back from when I was in preschool, when I had to keep a balance between watching Elmo and mixing 48k tracker modules. Oh, my. I was still living in France and composing MIDIs. Wish I knew this site existed. I hadn't even started working with mario paint yet, and I'd only barely learned the guitar. 12 years changes a lot of things.